BART trains roll on as the unions and transit agency come to a tentative agreement. Last-minute negotiations between BART management and union leaders over the weekend paid off. A planned strike has been averted -- again. BART management officials and members of the Amalgamated Transit Union Local 1555 met behind closed doors all day Sunday. Starting at 6:30 p.m., just about six ahead of the deadline, word began to spread that a deal had been reached and the strike had been called off. Terms of the deal are still secret but the bottom line still achieves the major goal of cutting $100 million from the agancy's budget, BART General Manager Dorothy Dugger says. 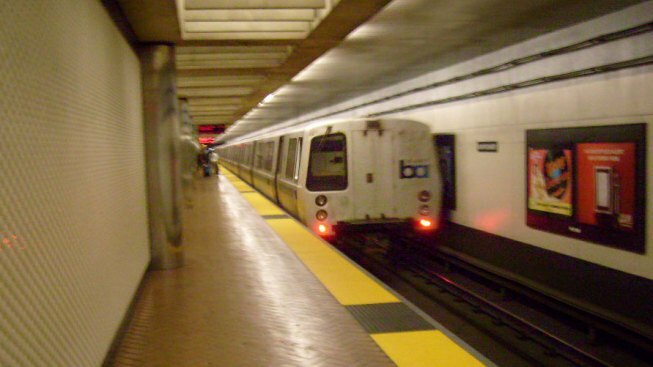 Local 1555 had threatened to strike at midnight after BART's board of directors imposed work rules that the union says amounted to a 7% pay cut. BART board vice president James Fang of San Francisco told reporters Sunday evening a tentative agreement was reached. Fang said he thinks averting the strike is "the greatest thing for the Bay Area." Arriving at the negotiation site immediately after Fang, San Francisco Mayor Gavin Newsom said, "I couldn't be more proud" that there is a tentative agreement and thanked both the BART board and labor. "We've worked to an agreement that we believe is equitable," ATU President Jesse Hunt said. "We're pleased to announce with this tentative agreement, our members will be working tomorrow. Trains will run." Hunt said he was confident his members would ratify the deal in a vote next week. If they turn it down, however, the threat of a strike could return. The traffic disaster caused by a BART strike would be complicated by a closure of the Bay Bridge, slated to start September 3 and continue through Labor Day Weekend. BART General Manager Dorothy Dugger gave some details of the contract. She said it eliminates work rules that management believes are inefficient and costly and achieves $100 million in labor costs savings to help the transit agency cope with its large budget deficit, which it estimates to be $310 million over the next four years. Hunt said, "We regret it (an agreement) had to come about this way but said he's also happy that service won't be disrupted." Gov. Arnold Schwarzenegger said in a statement, "I applaud both Amalgamated Transit Union and BART for working through their differences and reaching an agreement before immensely impacting Bay Area commuters with a strike." "With this agreement," Schwarzenegger said, "the hundreds of thousands of Californians that rely on the services BART provides will be able to continue to conduct their everyday business without interruption. I commend both sides for coming to a resolution." Waiting in the balance of the negotiation process were 340,000 daily BART riders. A strike could have put another 60,000 vehicles on the road and created hours-long delays on roadways, the Metropolitan Transportation Commission said. All day long there was a sense of optimism. "We think that there is a reasonably good chance that we will settle. We are cautiously optimistic," BART board of directors President Thomas Blalock said during a news conference Sunday morning. BART had scheduled 6 p.m. and 11 p.m. news conferences to update the public and the media on the negotiations. The 6 p.m. press conference was canceled with five minutes' notice. A representative came out to tell reporters that it was not going to happen. He also said at that time "they were making good progress." The two sides also met on Saturday. Many riders said they thought the unions should be happy with the contract, which pays an average $64,428 a year. That does not include the employee benefits package, which is another $29,750. The union said all along that salary was not the sticking point. They said a four-year contract, which the other unions approved, is too long to wait for any possible salary increase. They said that if the economy turns around, they wanted the option to get a raise sooner than four years. Two other BART unions voted earlier in the week to approve management's contract offer but their leaders had said they would have respected picket lines if ATU Local 1555 had gone on strike. Transportation agencies in the region were preparing to increase service in the event a BART strike would overwhelm the area's freeways and public transit services. "I'm happy it's resolved, but we had a contingency plans in place, just in case," said Randell Iwasaki, director of the California Department of Transportation. As concerns of a strike mounted, area and state transportation officials encouraged commuters to leave an hour or two early and to use possible alternatives such as car pools, arriving and leaving work later and working from home. Had there been a strike, BART said it had been prepared to provide limited bus service between stations in the East Bay and downtown San Francisco. Ferry service from Oakland and Alameda County to San Francisco would have been expanded and the San Francisco Municipal Transportation Agency said it would have add more buses and streetcars to accommodate passengers.